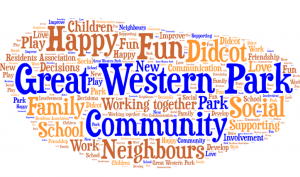 Welcome to the website of the Great Western Park Residents’ Association (GWPRA). We are a growing community on a 3,466 home development, straddling the South and Vale border, just west of Didcot, Oxfordshire, UK. The Residents’ Association (RA) was officially formed following a residents’ meeting held on the 24th May 2012. RA meetings are held monthly on the second Monday of each month at 7:30pm until 8:30pm, at the Boundary Park Pavilion, Great Western Park. There are no meetings planned for August, in order to allow for annual summer holidays. The next meeting will be Monday 13th May 2019. This will be the AGM. Everyone is invited to the meetings, so please come along take the opportunity to meet your new neighbours and find out more about your Community.